2Pat your chicken dry with paper towel, drizzle it with oil and sprinkle with salt and pepper. If you like, tuck half a lemon and/or some fresh herbs in the cavity. 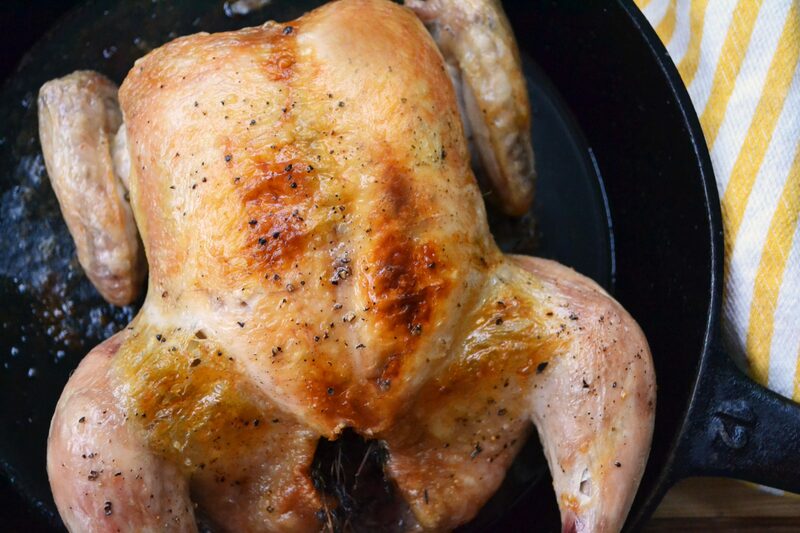 3Carefully place the chicken in the hot skillet, breast-side up, and roast for 30 minutes. Don't open the door to check on it. After 30 minutes the juices should run clear and the joints should wiggle in their sockets; if you have a meat thermometer, it should read 155F when poked into the meatiest part of the thigh. If not, pop back into the oven for 15 minutes. Cover and let rest for 5-10 minutes (the temperature will continue to climb a few degrees).